The new café/bakery at Bo Diddley Plaza will have a grand-opening celebration on Tuesday morning with giveaways and a special cupcake as a fundraiser for Pace Center for Girls. 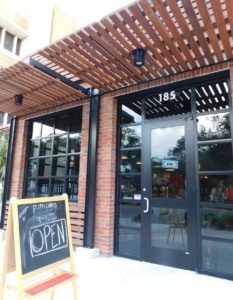 Downtown Gainesville finally has a cafe dedicated to providing coffee and tasty breakfast items six mornings a week. Patticakes opened last week in a brand-new building on the northeast corner of Bo Diddley Plaza, at 185 E. University Ave. The entrance to Patticakes on East University Avenue. 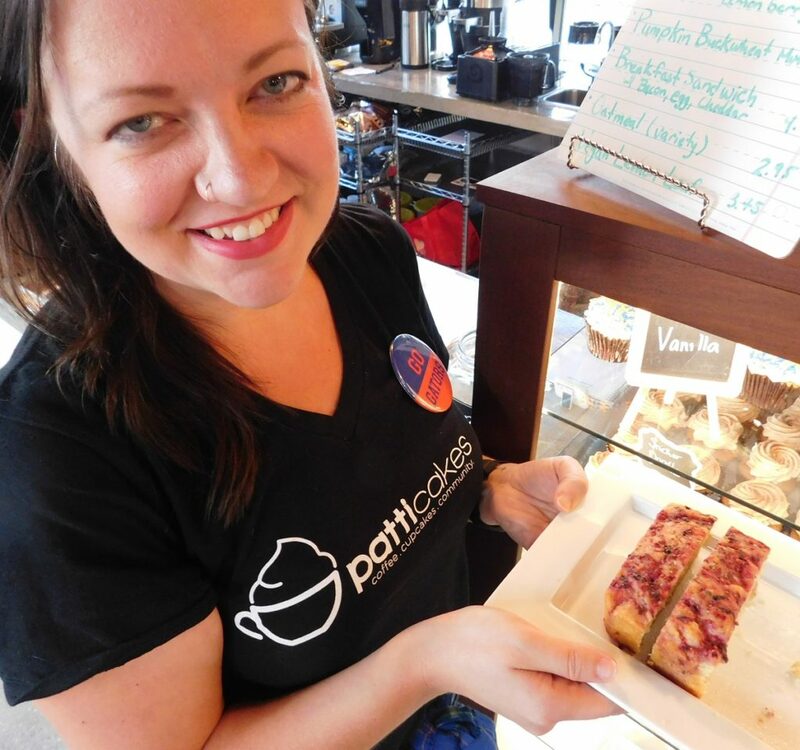 “I think working professionals appreciate the ability to enjoy a good breakfast before heading to the office,” said Erin Leigh Patterson, whose parents, Jan and David Patterson, have operated Patticakes at Haile Plantation Village Center for the past five years. 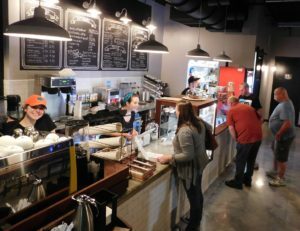 The new Patticakes, adjacent to Alachua County Civil Justice Center, also serves paninis, cold sandwiches, salad, baked goods and ice cream throughout the day and evening. On Tuesday, Patticakes will celebrate its grand opening with a 9 a.m. ribbon-cutting ceremony attended by Gainesville City Manager Anthony Lyons and other dignitaries. Those attending will be able to sample coffees and breakfast goodies. There will be hourly giveaways of coffee and merchandise. A “Toast to Patticakes” will take place from 5-7 p.m. with free mini-cupcakes being handed out. Also, Patticakes will be selling a special Mocha Cappuccino Crunch cupcake all day for $3.50 that includes a free small house coffee. A portion of the proceeds will go to the Pace Center for Girls. The opportunity came in partnership with the Gainesville Community Redevelopment Agency (CRA), which oversaw the recent redevelopment of Bo Diddley Plaza. The CRA recognized the need for a café in the heart of downtown Gainesville as an enhancement for the Plaza. Customers line up at Patticakes on a recent evening. Erin Leigh Patterson, who is Patticakes’ marketing manager, said that Bo Diddley Plaza is the perfect location for her parents’ newest café. Patterson added that Patticakes worked closely with the general contractors, Oelrich Construction, to create a welcoming environment for customers. Patticakes passed its final inspections on Sept. 9 and decided to open that evening during a Free Fridays Concert by Flat Land. Erin Leigh Patterson holds the Lemon Loaf vegan option. Patticakes offers 12 flavors of Hershey’s all-natural ice cream at any given time. 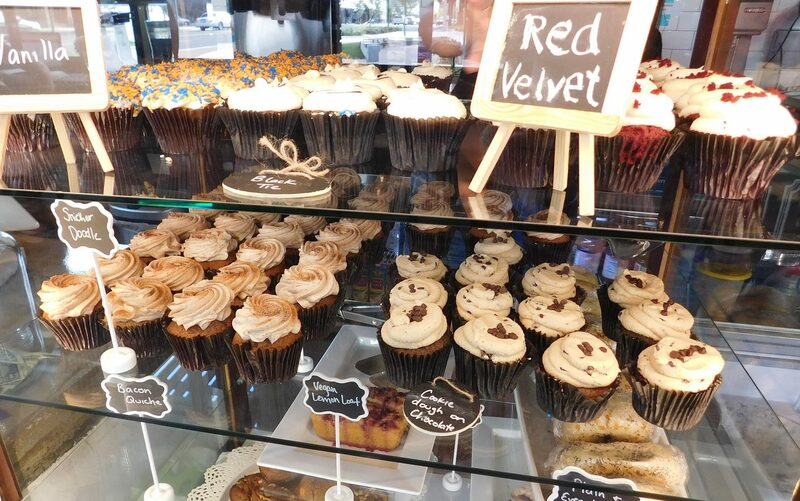 There’s also a nice selection of cupcakes, including everyday favorites Red Velvet, Black Tie and Vanilla as well as weekly specials such as Snicker Doodle and Cookie Dough on Chocolate. All are made from scratch in the Haile kitchen. For vegans, there is a Lemon Loaf made without eggs or dairy products. Vegans also can choose from soy milk, coconut milk and almond milk for their coffee. Patticakes sells coffee roasted locally by Rembrandt Coffee, whose owner, Ken Rembert, direct trades with coffee growers in Guatemala and other nations. “We support a local business owner, its locally roasted coffee, and we’re supporting farmers through direct trade,” Patterson said. 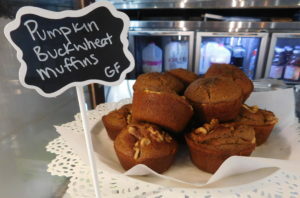 Patticakes’ Pumpkin Buckwheat Muffins are gluten-free. 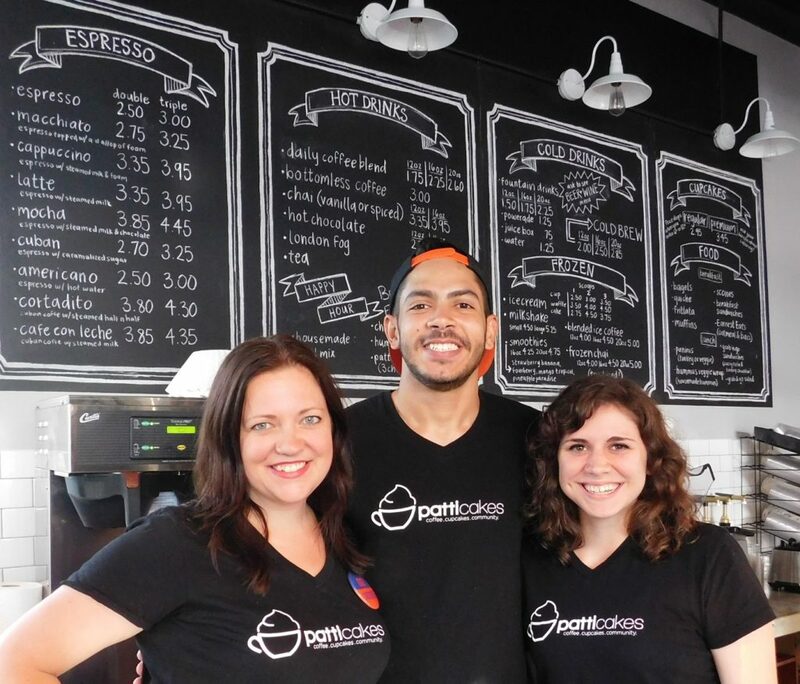 To get the coffee just right, Patticakes uses a manual espresso machine. Customers can order lattes, café con leche and other specialty beverages all day as well as blended ice coffee. A cup of house coffee starts at $1.75. Breakfast, served daily until 11:30 a.m., includes egg sandwiches, a bacon quiche, a vegetarian quiche, frittata, scones, gluten-free muffins and oatmeal to go. Lunch items include Turkey and Cheddar on a Croissant, a Vegan Curry Tofu Wrap and a House-Made Hummus and Roasted Chickpea Wrap. Tiffany D. Williams will manage the Patticakes location at Bo Diddley Plaza. She is a longtime Gainesville resident who has worked with the Gainesville Area Chamber of Commerce. She also operates Gainesville Fashion Week and Williams & Co. Events. For further info, visit the Patticakes website.